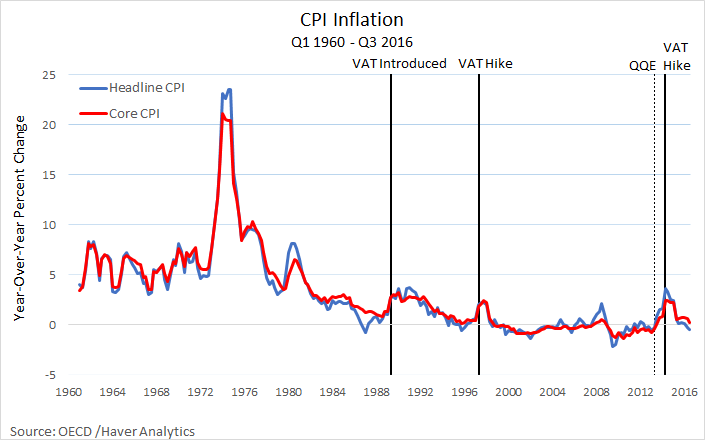 Maybe time to finally learn that inflation is about the rate of spending not about monetary policy, monetary financing, etc. 9 Ingelesez: “For the rate of inflation to rise, one of two things must happen:  the growth rate in the supply of nominal government debt must rise; or  the growth rate in the demand for government debt must fall. According to the joint statement mentioned above, the government’s commitment to helping the BOJ achieve the 2% inflation target amounts to reducing the demand for government debt by implementing reforms intended to create a bullish investment climate designed to stimulate real economic growth (the third of Abe’s three arrows). While this is fine as far as it goes, what’s the contingency plan in case the third arrow cannot be released or misses its mark? 11 Ingelesez: “The government of Japan, however, appears almost obsessively concerned with deficit reduction. Publications from the Ministry of Finance seem to go out of their way in raising debt-sustainability alarm bells. Consider the contents of this Japanese Public Finance Fact Sheet, for example. 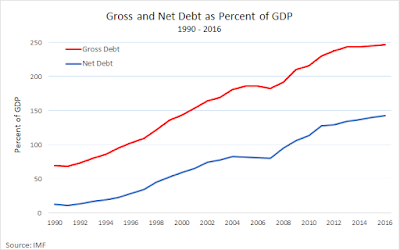 Most of the document stresses the need for “fiscal consolidation” (deficit reduction) and includes lessons to be drawn from the European debt crisis. The graph of total government expenditure on page 4 strangely includes spending on the repayment of debt. And on page 3, there is the familiar and misleading “here is what a family’s balance sheet would look like if it behaved like the government” exercise. This is a great way to promote the government’s seriousness about stabilizing the debt-to-GDP ratio. But it is not, in my view, a policy that is consistent with helping the BOJ achieve its 2% inflation target. 12 Ingelesez: “Moreover, if one further accounts for the sizable quantity of government assets, the ratio falls to 100% (see the balance sheet of the central government here on page 51). And finally, if one was to view the fact that 40% of government bonds are held by the BOJ and likely to remain monetized, the ratio falls further still. In my view, the very low yield on JGB’s reflects the market’s assessment that public finances in Japan are nowhere near being out of order (a caveat to this view here). 15 Ingelesez: “Let me conclude. First, this post is not meant as an argument in favor of the 2% inflation target. Second, it should not be construed as an argument against the Japanese government’s debt management strategy. Nor is it an argument against the BOJ’s asset purchase program. I will discuss these issues in a subsequent post. I last wrote about the dynamics of Japan’s bond markets in this blog post – More fun in Japanese bond markets (February 7, 2007). 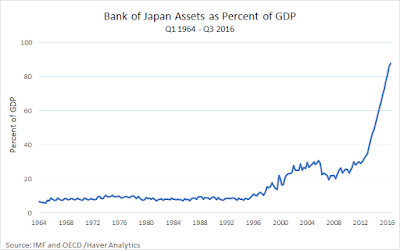 For further background, see this blog post – Bank of Japan is in charge not the bond markets (November 21, 2016). 1. If the demand for government bonds declines, the prices in the secondary market decline and the yield rises (see blog link above to understand why). 2. Once bonds are issued by the government in the ‘primary market’ (via auctions) they are traded in the ‘secondary market’ between interested parties (investors) on the basis of demand and supply. When demand is strong relative to supply, the price of the bond will rise above its ‘face value’ and vice versa when demand is weak relative to supply. 3. Any central bank has the financial capacity to dominate the demand for any specific maturity bond in the secondary markets and thus can set yields. Those who follow Japanese economic policy shifts will know that the Bank of Japan has been trying to push the inflation rate up for many years. The most recent attempt started on April 4, 2013 when its QQE bond-buying extravaganza was resumed. Since then this policy has morphed into an even more ‘easy’ money policy initiatives – October 31, 2014 they revved up QQE, then introduced their Negative interest rate decision on January 29, 2016, and then on September 21, 2016, they introduced their yield curve control decision. I outline those policy shifts in detail in the blog posts cited previously. 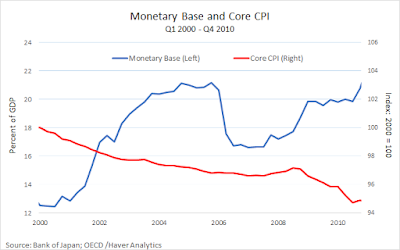 The point is that these monetary policy gymnastics have been largely unsuccessful. 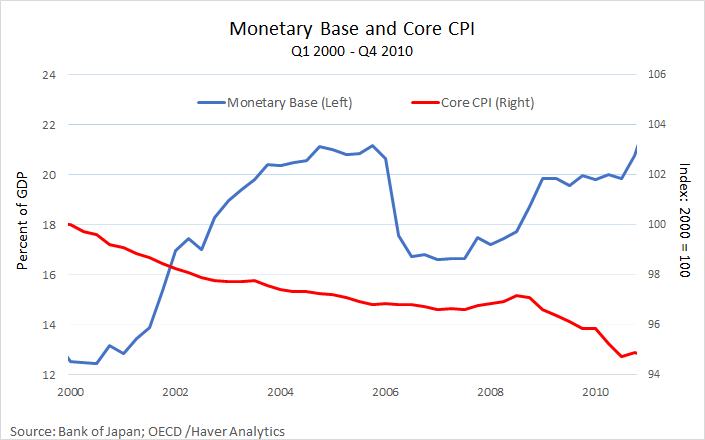 The spike in inflation you can see in 2014 was due to fiscal policy (consumption tax hike), which should tell you something about the relative strength of each of the two aggregate policy instruments (monetary and fiscal). 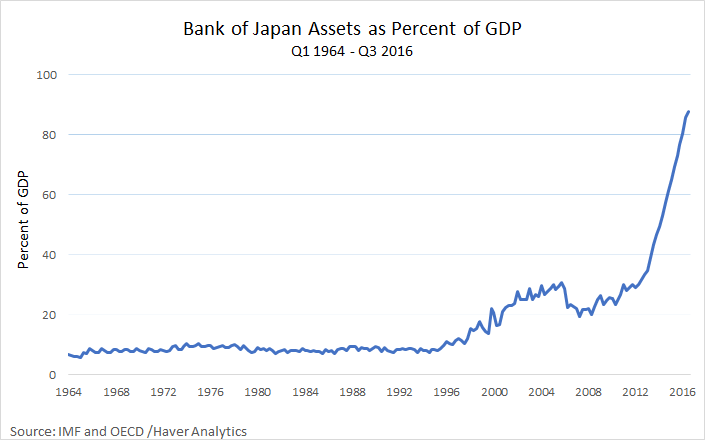 The point is that the Bank of Japan is now in a position of its own making. Having sworn that it would maintain its bond-buying program until inflation was in the 2 per cent range and with the Governor Haruhiko Kuroda suggesting in a – Speech to the Foreign Correspondent’s Club of Japan – on March 20, 2015 that “CPI inflation is expected to reach 2 percent in or around fiscal 2015”, the policy is being extended well beyond its initial scope. They are under attack from the banksters and speculators who are unable to make larger profits with long-term yields around zero. This graph shows the 10-year JGB yield from June 1, 2018 to August 30, 2018, with the spike on August 1 noticeable. The games started the week before when the 10-year JGB yield rose on July 23, 2018 by 0.052 points. That was a precursor to the larger rise on August 1. The largest single-day rise in 10-year JGB yields occurred on May 15, 1987, when yields jumped from 3.492 per cent to 3.83 per cent. Speculation was rife that the BoJ would relent on its “QQE with Yield Curve Control” program and start allowing yields to rise. There has been no shifts in inflationary expectations or, for that matter, bid-to-cover ratios (which might indicate that investors are increasing risk attached to these assets). It was a case of the usual “unnamed sources” telling Reuters that the policy had to ease even further – see their news report (July 21, 2018) – Exclusive: BOJ to debate policy change in July to make its stimulus sustainable: sources. The changes foreshadowed related to whether the bond-buying program was “sustainable” (Reuters word) given that it was likely that the inflation target of 2 per cent would take much longer than previously estimated to reach. Reuters quoted a “source” who “declined to be identified” (meaning I usually disregard) as saying that the “cost of prolonged easing is becoming ‘hard to ignore’”. Which you should read as saying the investors are annoyed that yields are being held at zero by the BoJ and want more amplitude to help them in their speculative behaviour. 1. “The BOJ could tweak its yield-curve control (YCC) programme to allow for a more natural rise in long-term interest rates to ease the pain on banks from years of near-zero rates, they say”. Which raises the questions as to why the debt is being issued in the first place. Who benefits? Obviously the banks want to return to the days where they could get risk-free annuities flowing to them from JGBs (aka corporate welfare). 2. “the bank’s huge purchases are drying up market liquidity and distorting price action” – meaning that the issuance of the JGBs is more about providing speculators with a risk-free asset which they can use as a benchmark to price their own risky assets and seek haven in when uncertainty increases (aka corporate welfare). 3. “the rising cost of prolonged easing, such as the strain on bank profits” (aka corporate welfare). The reality is that the BoJ would face a huge credibility problem if it abandoned its zero-rate YCC policy with the key inflation rate measure still a long way from reaching the 2 per cent target. How could they justify it other than as a sop to corporate Japan? 1. “The Bank intends to maintain the current extremely low levels of short- and long-term interest rates for an extended period of time”. 2. “The Bank will apply a negative interest rate of minus 0.1 percent to the Policy-Rate Balances in current accounts held by financial institutions at the Bank” – so a tax on reserves. That footnote tells you everything really. I will come back to it. 4. “the Bank will conduct purchases in a flexible manner so that their amount outstanding will increase at an annual pace of about 80 trillion yen”. 5. There were some changes in the way the BoJ deals with purchases of non-government bonds. Bloomberg reported that the ‘market’ considered that statement meant that the BoJ would “double” the permitted fluctuations in the 10-year bond yield from “0.1 percentage point on either side of 0 percent” to 0.2 per cent. 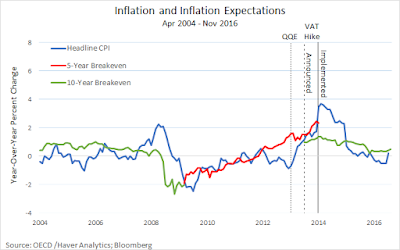 That is also what the FT article (August 1, 2018) – Japanese bond market jolted as traders test BoJ resolve – had reported, viz … “The central bank doubled the level it will permit 10-year yields to climb from 0.1 to 0.2 per cent”. As a result the yields started moving about as the bond traders ‘tested’ the BoJ “resolve” (FT words). The message Kuroda was keen to give was to allow a wider movement in 10-year bonds but that doesn’t mean he’ll allow it to drift … The market is now going to find out what it can get away with. That statement is very significant. When I child tests their parent’s resolve to see what “it can get away with” it demonstrates who has the power in the relationship. It is the same with the relationship between bond markets and central banks. The former operates within the space granted to them by the policy decisions of the latter. The central bank always calls the shots on yields and the bond markets only set yields if the government allows them to. 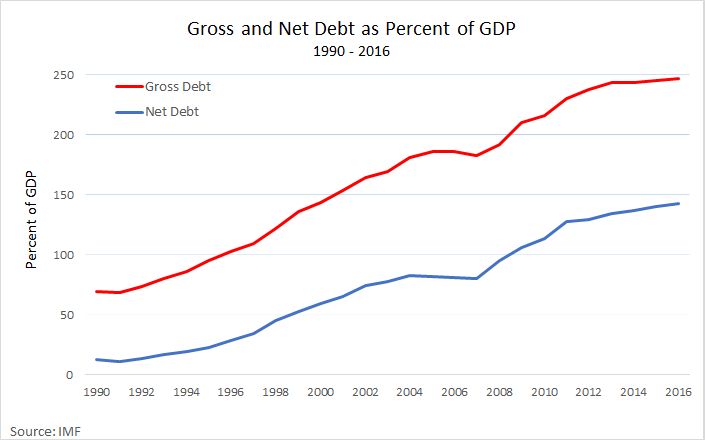 This should tell you that all the claims made by mainstream economists and the sycophantic commentators that just copy their words that bond markets will drive yields up when they lose trust in a government’s ability to pay and this sparks a crisis which can only be resolved by fiscal austerity are hollow. The bond markets can never drive a currency-issuing government into insolvency. The bond markets can never drive yields up to elevated levels unless the government (via its central banks) allows that. The bond markets are mendicants in this context. And it didn’t take long for the JGB speculators to learn the lesson – again. Just two days after the MPC met (July 31, 2018), the BoJ launched a so-called “special buying operation” (outside schedule), which stopped the rising yields in their tracks. This demonstrated that the speculation in the week or more before that the BoJ would allow the fluctuations in 10-year bonds to double was folly. On August 2, 2018, the Deputy Governor of the BoJ told journalists that “If yields rise rapidly, the bank will purchase JGBs promptly and appropriately” (Source). The graph above (10-year bond yields) shows that the BoJ is maintaining a slightly wider yield margin under its yield curve control and QQE program but not as large as the financial markets desire. Mainstream economists eschew this sort of strategy and claim that the central bank can only achieve this outcome if the targeted yields are consistent with what the bond markets want anyway. There would be no problem arising from that eventuality. 5. 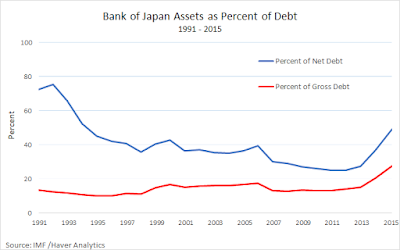 If private investors choose to buy other assets once the risk in international markets subsides then the Japanese government (the consolidated central bank and treasury) could just buy more of its own debt – to near infinity. Here is my latest ‘surface’ graph for Japan for the period July 1, 2018 to August 31, 2018. The depth axis shows the date span covered. In the shorter maturities JGBs, there is remarkable stability across this period with the negative interest rate policy being maintained. Investors are providing loans to the Japanese government at negative rates righ up to the 7-year maturity. You can also see the ripples across most maturities at the end of July, coinciding with the ‘testing’ period. And then once the BoJ reasserted its position and the fluctuation range was clearly lower than the markets hoped for, the surfaces became stable again. 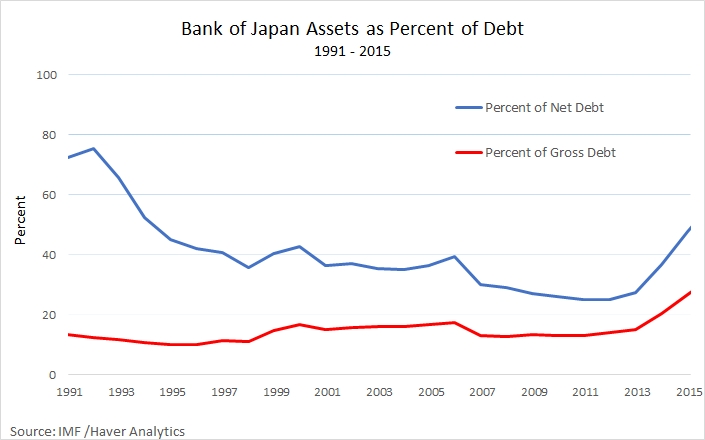 To further accentuate the point that the central bank calls the shots, the following graph shows the proportion of total national government debt in Japan that is held by the Bank of Japan from January 1990 to June 2018. The secondary JGBs market has been very thin since the QQE program began and sellers in that market have declined. In February 2011, the Bank of Japan held 7.1 per cent of all the outstanding JGBs (across most maturities). By September 2016, that ratio has risen to 47.4 per cent and will rise further as the QQE program continues. Since the April 2013 announcement, the monetary base has risen from 1,495,975 trillion yen to 4,976,398 trillion yen (as at end June 2018). 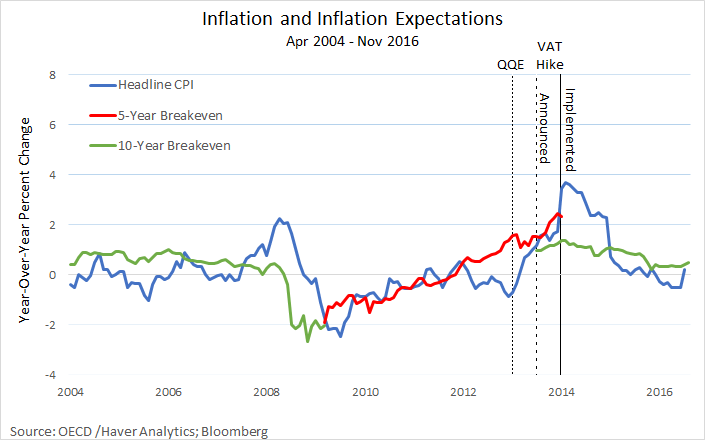 Where is the accelerating inflation? Answer: in flawed Monetarist textbooks! Since the April 2013 announcement, bank reserves have risen from 595,334 trillion yen to 3,444,126 trillion yen. Where is the boom in bank lending? Answer: in flawed mainstream monetary textbooks!